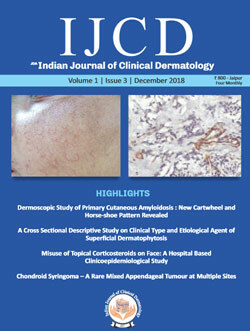 We are moving forward and I bring you the third issue of JDA INDIAN JOURNAL OF CLINICAL DERMATOLOGY. I am pleased to tell you that we have many subscribers now and the support for the journal is increasing. I congratulate and thank our authors, reviewers and my team for that. We are now moving forward to get our journal indexed. As promised we take every effort to publish only quality articles after proper review still your valuable suggestions are always welcome. Please go through our current issue and give your feedback. I thank you for your support.